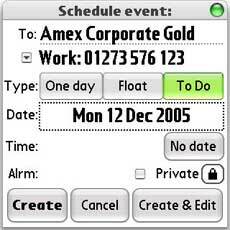 For ages Treonauts have complained about specific aspects of the Treo or Centro “Contacts” program functionality such as the inability to list by “First Name, Last Name” or to search by “Company Name” without using the Global Find (Option+Shift key) as well as creating Calendar appointments or Calls. 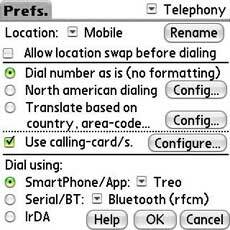 However, while researching my post “Using Speed Dial for Low International Calls” I came across an application called TAKEphONE that many Treonauts had recommended and to which I have now become a complete convert myself. Upon installation TAKEphONE ($19.95) provides you with the option to link the “Phone” button to the program but I preferred to skip this and instead mapped the first Favorite button to replicate how I used to access my Contacts (right). 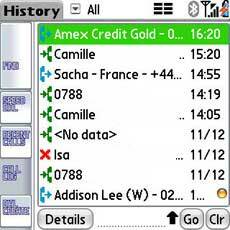 After setting some preferences, my TAKEphONE main screen (below left) lists my first 100 contacts and using the keyboard will quickly bring up the contact that you are looking for (in this case Amex) and indicates how many results it has found (18 here). The Find functionality works like the exisiting Contacts in that you can key the first letter of the First Name and as many letter of the Last Name to quickly find that contact. Additionally, as I mentioned TAKEphONE specifically allows you to search within 10 fields including Company. Pressing the Center 5Way button brings up the contact details page (below right) from which you can easily either edit or dial any number. Within the Details page you can also press a button at the bottom of the screen to conveniently SMS, Beam or Schedule a Calendar appointment. 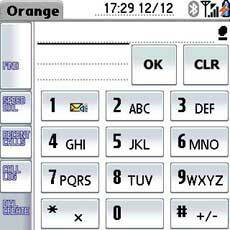 There are five tabs on the right of the main TAKEphONE screen which allow you to access your Speed Dials (equivalent to Favorites), Recent Calls, Call Log and Dial Create where you can tap a number on screen or on the keyboard to Make a Call, Send SMS, Lookup, Schedule or Add to Contacts. 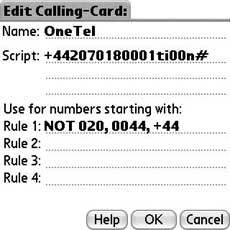 Additionally, TAKEphONE has an extremely useful function in its Telephony Preferences (below) which allows you to set a Calling Card profile through which (for example) all of your international calls can be automatically re-routed. This works phenomenally well and I’m now using it daily (I highly recommend reading the manual for help on setting up the required script). Overall, TAKEphONE is one of the simplest and most complete Contacts/Phone replacement applications that I have come across and anybody yearning for a better solution than the built-in program in our Treo or Centro will quickly be won over by it. 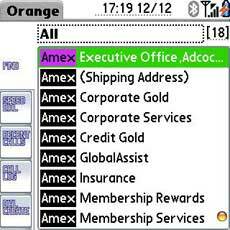 It uses the built-in contacts database. 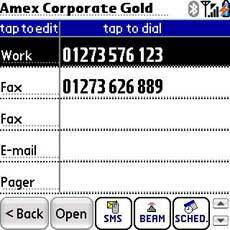 I have used TakePhone since I got my Treo and I LOVE the application. My question is how did you map it to your #1 favorite button. It does not give me an option to do it. In your review I noticed the resolution of this app. was very good. When I downloaded it though the reolution was normal. How can I activate the good resolution? What is that fantastic painting you have as your wallpaper in TAKEphONE01.jpg? I really dig it a lot. 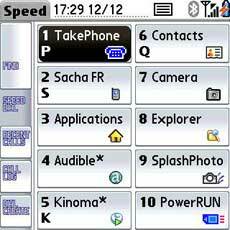 Is it possible to use TALKPHONE v6.5 in TREO 680? "Telephone library not found (050A)"
So Please let me know if you have any answer? 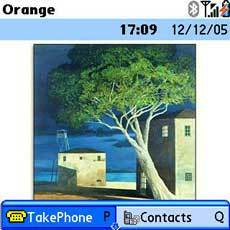 Is it possible to use TAKEPHONE v6.5 developed by Shsh Software in TREO 680? Can this application block certain calls text messages and is it compatible with Ringo? I have used this program for several years and it just keeps getting better and better. I consider myself a power user and use many of the features this program offers EXTENSIVELY. 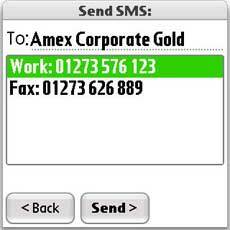 I have over 2,500 contacts in my phone (each with at least 2 phone numbers) and searching for contacts is a breeze. 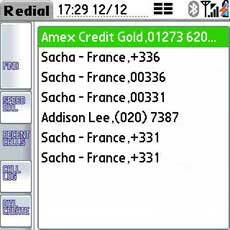 If you travel internationally the most valuable feature this program offers is the Telephony option which lets you configure how to dial a contacts phone number depending on where you are dialing from. AWESOME!!! Installation is easy while configuring the program to use all of the features may take a little time but definitely worth every second.